In the spring of 2016, Progressive Source was hired to build a public awareness campaign to support a grassroots coalition of Native Hawaiians, environmentalists, parents and farmers in their historic struggle to challenge three Hawaii federal district court rulings on appeal. These troubling rulings ruling invalidated common sense public safety laws in Maui, Hawaii and Kauai counties that were passed to regulate experimental test farms that spray massive amount of pesticides on GMO crops. along with subsequent campaign-related media including this public interest advocacy column in the Huffington Post, characterized these cases, which are still being considered by the Ninth Circuit Court of Appeals, as having the potential to become the environmental equivalent of the notorious Citizens United ruling. We described the ominous Monsanto Doctrine as the right of polluting corporations to do as they choose, in violation of any and all local or state public safety laws created to protect humans and the environment. As an integral part of this campaign, Progressive Source created and marketed this ‘Stop Poisoning Democracy” petition for change.org. More than 43,000 people from around the world have signed this petition, hundreds of them leaving eloquent, supportive comments. The petition signers have been updated about the legal cases, and related issues, such as the follow up column in the Huffington Post entitled, “Obama Expands Monsanto Doctrine by Signing DARK Act and Invalidating Vermont GMO Labeling Law.” This column was shared by nearly 3,000 people, and seen by hundreds of thousands of others. 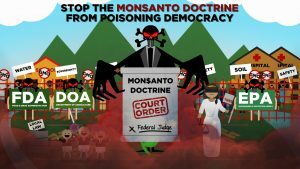 Progressive Source’s “Be the Media” strategy for the Campaign to stop the Monsanto Doctrine also included the creation of curated video, like this one, which took three hours of complex oral arguments and boiled Monsanto’s startling legal claims down to a few comprehensible minutes. Other videos, including coverage of Native Hawaiians marching to support our ecology that went unreported elsewhere, can be viewed on Progressive Source’s Vimeo page here.